LiuGong ’s new 45-tonnage reach stacker, CLG2450, rolled off the production line at LiuGong International Industry Park in Liuzhou, Guangxi, China. As LiuGong’s first large scale machine specifically built for usage in ports for container loading and unloading, it marks an important milestone in the development of LiuGong ’s material handling business. The CLG2450 is designed for container transshipment in seaports, railway stations and cargo yards. It can be used for container handling, stacking and short haul transport operations. As LiuGong’s first heavy-duty material handling machine, the CLG2450 has a 45-tonnage base capacity. 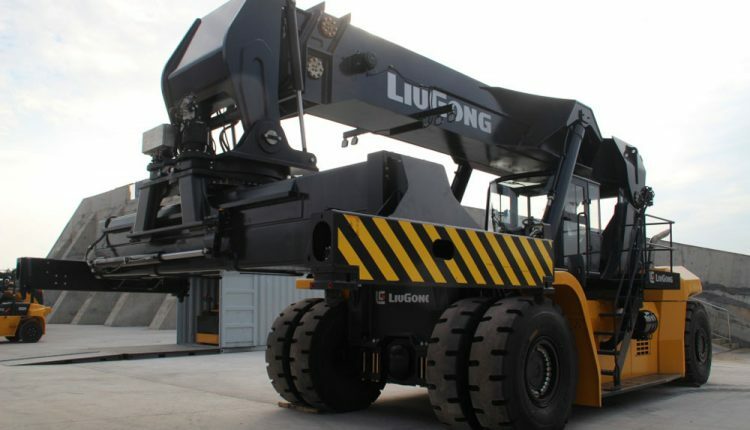 It is the largest and heaviest product and has the most complex hydraulic and electronic control technology in LiuGong’s material handling product line up. To meet the demands of customers, the machine adopted many advanced technologies including SAS technology, negative flow feedback control, constant power variable control, temperature variable cooling control, electronic and intelligent touch control and unified managing of engine, gearbox, hydraulic system and braking system by CAN bus. Additionally, all key components were specifically designed and made by world-leading component suppliers. Making the operation of the machine intuitive, efficient, and accurate was a key drive in the engineering and design; the digital control system ensures this with full digital, multi-language interface and an automatic fault detection system, allowing for quick maintenance and repair. Designed by LiuGong’s Industrial Design team in the UK and the forklift R & D team in Liuzhou, the ergonomically designed machine gives operators a safe, comfortable and easy operating machine. The implantation of China’s “the Belt and Road” strategy, the expansion of global trade and constant investment in the port construction have all resulted in the rapid growth of cargo transport operations. Per statistics, port container throughput has maintained a more than 5% growth in recent years, resulting in a demand for application specific equipment to increase efficiency and productivity. With the development of the its new product, LiuGong is now able to offer customers another machine that meets the needs of their market.